1964 Alfa Romeo Giulia 1300 Owners Manual. 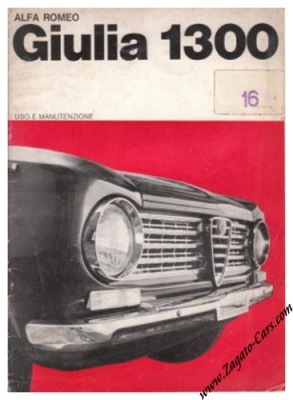 Vintage July 1964 owners manual for the Alfa Romeo Giulia 1300 (single carb, disc brakes). Print reference: N. 984 7/64. Very good condition for its age but with an ungainly sticker on the cover with # 16 on it and two dealer stamps on the first page.